There’s going to be some fairly gruesome pictures, but I’ll put them at the end with some padding. Last Tuesday Dr. Sauer examined my foot again, had some additional X-rays taken, and concluded that it would probably be better to go ahead and put a plate on my fibula. There was enough displacement of the broken bone (about 3mm) that if it was left to heal as it was, I would end up with a somewhat “loose” ankle that might experience residual pain and would be prone to osteoarthritis in the future. He added that, with my swelling down, the surgery should go quite well and would actually reduce my recovery time by allowing the bones to knit faster. So Friday morning I went in for surgery. I mentioned to the anesthesia nurse that I tended to get a “shy bladder” after surgery and that I would rather have just a little more pain that end up being catheterized. (To each his own.) I then got the IV put it — as competently as it has ever been done; the whole nursing staff were superb — and got wheeled into the operating room. They rolled me onto the table and started the sedative in the I.V., and that was all, folks. I came to, still very groggy, to find that my leg was in considerable pain. I managed to get my mouth working well enough to say “Pain”, and in a few minutes I could tell they were putting a nerve block into my knee. That very effectively took care of the pain. I started coming out of it for real shortly after. I was aware of what was going on around me and what people were saying well before I could work my mouth correctly, but some ice chips helped with that. My friend, Jeremy Conlin, was there; Cindy had had to leave to pick up Michael from school. She got back shortly after. I was in the hospital for some time, because they were not going to release me until I had produced some urine, and I was both genuinely dehydrated and suffering from the usual shy bladder. I finally produced a couple of squirts and that was enough for the nurses to pull out my IV and send me home. Got home and found I was able to produce another cup with some patient effort; that corner was turned. Thank goodness. You might say it was touch and go for a while, but eventually the difficulty passed. I had an okay evening until about 11:00, when my foot began to tingle and I could start to move my toes. I took two of the hydrocodone and a couple of ibuprofen in anticipation of the nerve block wearing off. Within about an hour, it was clear that they were not even touching the pain; I was really hurting. I used to say that I was saving 10 on the 1 to 10 pain scale for if I was ever guillotined, but I was seriously reconsidering that. I finally called Dr. Sauer’s cell phone and left a message, then called the hospital and asked if they had a duty nurse. I got transferred to E.R. I explained my problem and asked what they advised. I was told to go ahead and take two more hydrocodone and four more ibuprofen, and if I was still in unbearable pain after an hour, to come in. I didn’t need to; the second dose finally took hold and I was able to start dozing off. Dr. Sauer called about that time; I apologized for getting him up, he explained that I actually hadn’t (he was up and saw the message on the phone) and I reported that the second painkiller dose had knocked it down. He asked me how much I had left and promised to write a prescription for some oxycodone in the morning. It’s possible that my daughter and I share a resistance to many narcotic painkillers. Bummer. Sunday was better still, and I was feeling almost human this morning. My friend, John Dahl, took me for my followup with Dr. Sauer, who pronounced himself pleased with how my foot looks. My plan is to start weaning myself off the narcotics today and try to go back to work Wednesday morning. 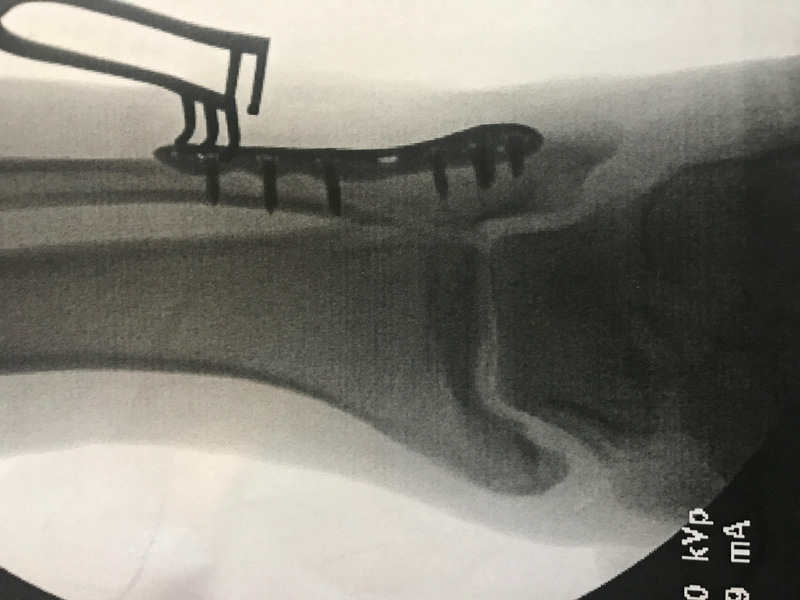 Dr. Sauer reports that the surgery went quite smoothly; the only difficulty was initially lining up the bone fragments, but he was able to get them clamped into position and then screwing the plate on was straightforward. 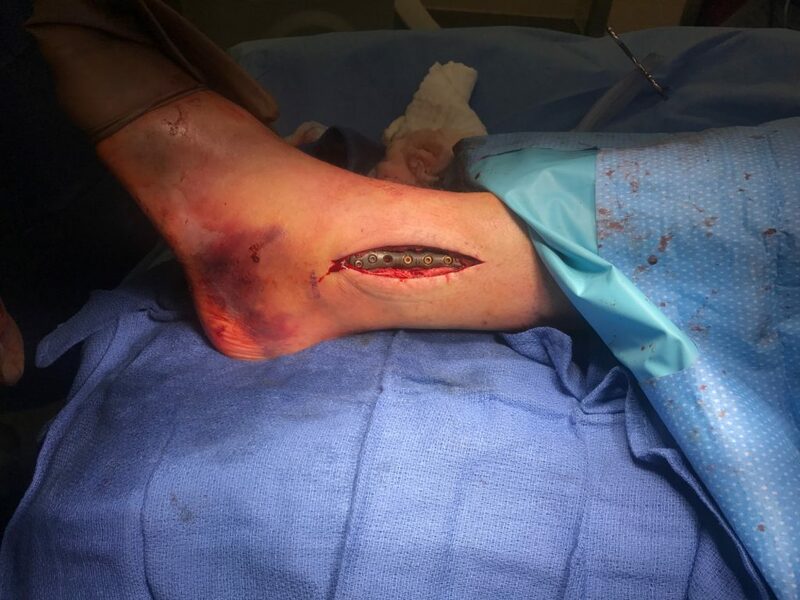 Apparently the subcutaneous tissues were particularly easy to stitch together — very little swelling — so the closure was a good one. The fracture blisters are all but gone now, and I don’t miss them, though they’re now memorialized on Wikipedia. Anyway, I am cautiously optimistic that the trajectory is now upwards. I suppose you’ll be setting off airport metal detectors for a while. Not if I can help it. Have been avoiding air travel for years now. The metal detectors are supposedly set to a higher level than most pins and plates. That’s old info, but I asked when I had my hardware in. I could go through the metal detectors with the hardware and a pair of wooden crutches with all of their screws and wingnuts and not set it off. This would have been back in the late 1980s. Glad to hear that airport metal detectors are not particularly sensitive to wingnuts.